Home › Quebec › Saint-Laurent › Travel Near Me in Saint-Laurent › Signature Vacations Inc.
Signature Vacations Inc.is a travel agency based in Canada offering luxury all-inclusive vacation packages. Signature Vacations offers more than 150 hotels and resorts in destinations throughout Central America, Mexico, and the Caribbean. They also offer direct flights from 30 cities across Canada. Signature Vacations offers discount group travel and affordable airfare options. Products Carried: Signature Vacations Inc.is a Canadian travel booking agent specializing in luxury all-inclusive vacation packages. They offer a variety of vacations to the top tourist destinations. 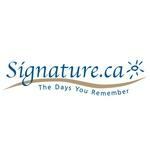 Established in1972, Signature Vacations is a member of Sunwing Travel Group. Give to Signature Vacations Inc.
You will receive updates from Signature Vacations Inc.